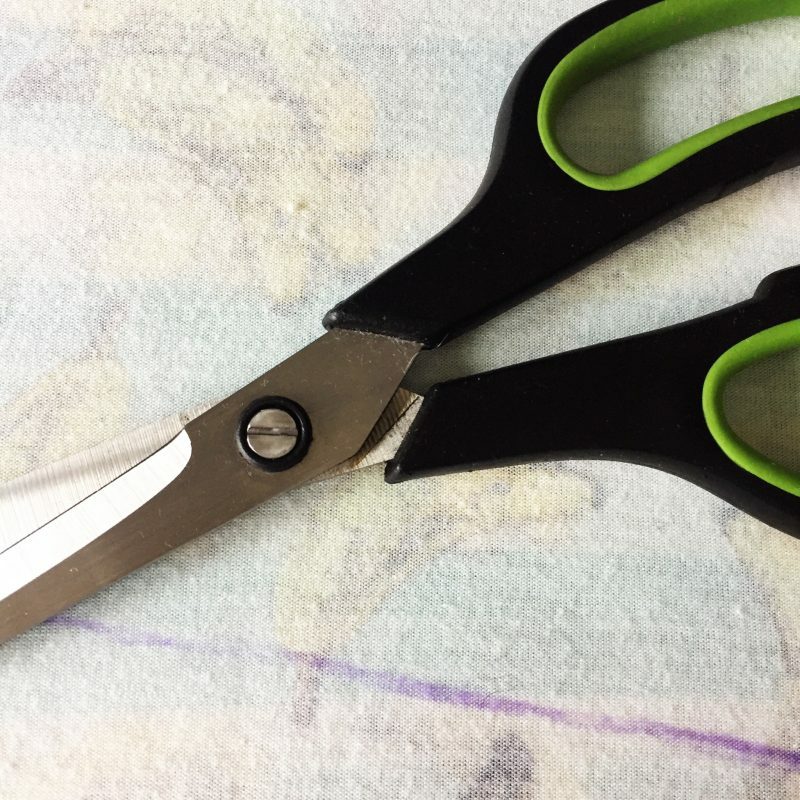 Do you refashion any of your handmade clothes? I don’t think I ever have before but this Lady Skater Dress was calling out to be refashioned! Autumn light levels are not good for taking photos! 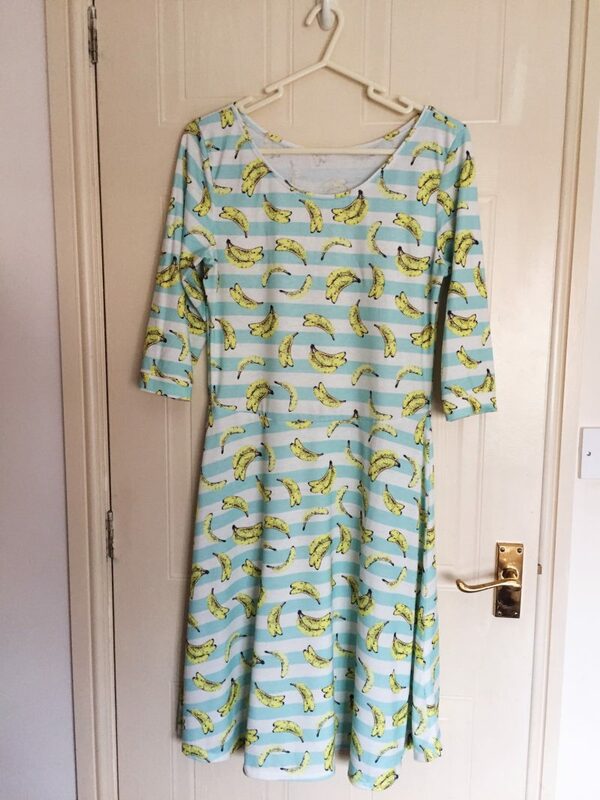 Do you remember the banana Lady Skater Dress? This fabric purchase was a mistake. I totally hold my hands up and say that I got carried away on a shopping trip to Barry’s. 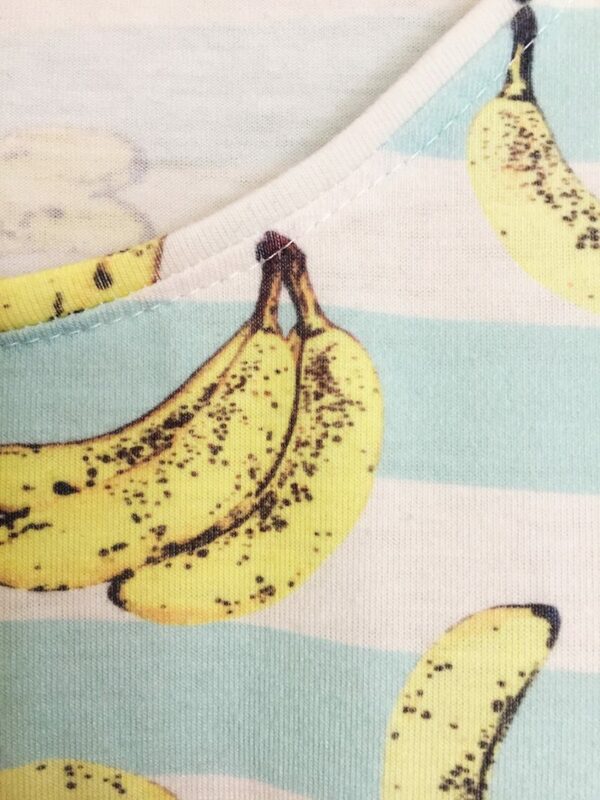 Really I should have considered that white and mint stripes covered in bananas was a bit toddler-esque for day wear. Even for me. I’ve tried to love this dress, I really have. I wore it for City of Colours when my Etsy team were making a gigantic pink gorilla. What else would you wear when making a gigantic pink gorilla?! Sadly, this dress has been worn about five times total. It happens sometimes doesn’t it? Even with well-considered fabric purchases (which this obviously wasn’t) we can make things and just not feel excited about them when they’re finished. I guess that’s no different from buying ready to wear, except the problem with handmade is all the damn effort you’ve put into it! 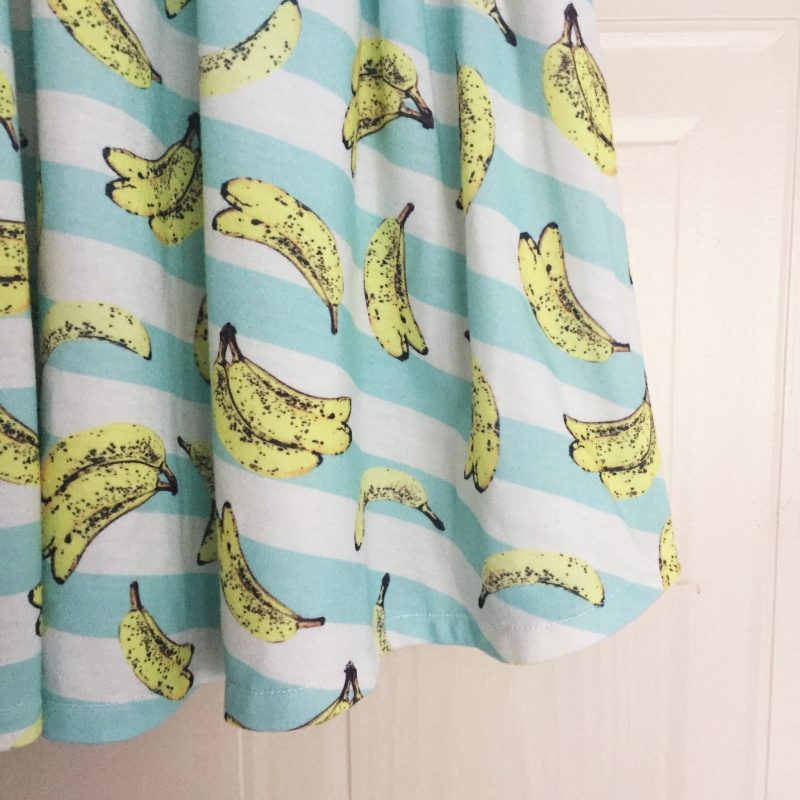 I still have a soft spot for this crazy fabric though, even though all over bananas is clearly not a good look for me. In the spirit of sustainable sewing I decided to have a go at refashioning this unloved dress into something for both me and my eldest daughter to wear. 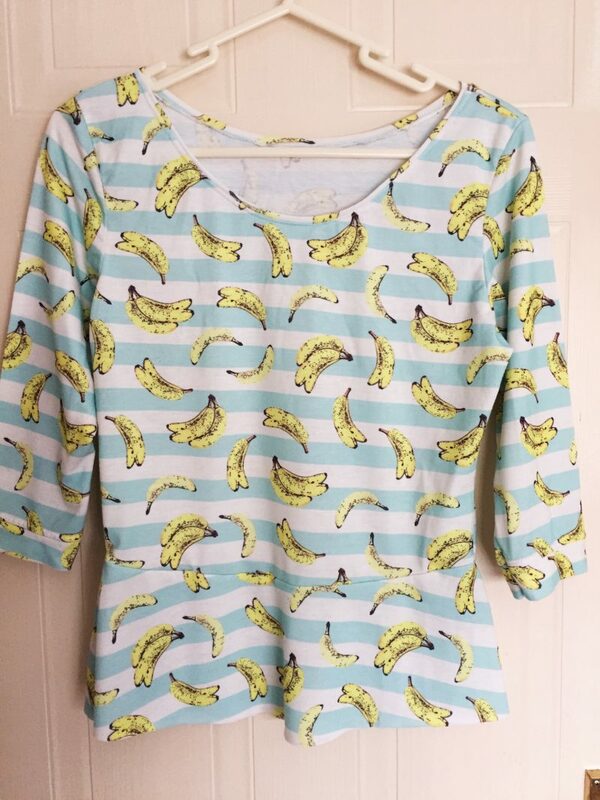 Every time I pulled this dress out of my drawer, I just kept thinking how I should have made a t-shirt instead. So basically that’s what I did. I wouldn’t win a prize for this refashion that’s for sure! I knew that if I unpicked the waist seam I’d end up with a top that was too short. Also, I don’t have the patience for unpicking things unless I really have to. All I did was lay the dress out flat, put a t-shirt that fits me well on top of it and draw a line underneath. See? Ridiculously easy. Once I’d cut the majority of the skirt piece off, I was left with a top with a peplum. Much more wearable than the dress I think. It’ll go nicely with this skirt and also a vintage denim dress I haven’t blogged about yet. I didn’t want to waste the fabric that I’d cut off so a second ridiculously easy refashion was born. My six year old has had her eye on this fabric since I bought it, which is fair it’s far more age-appropriate for her. 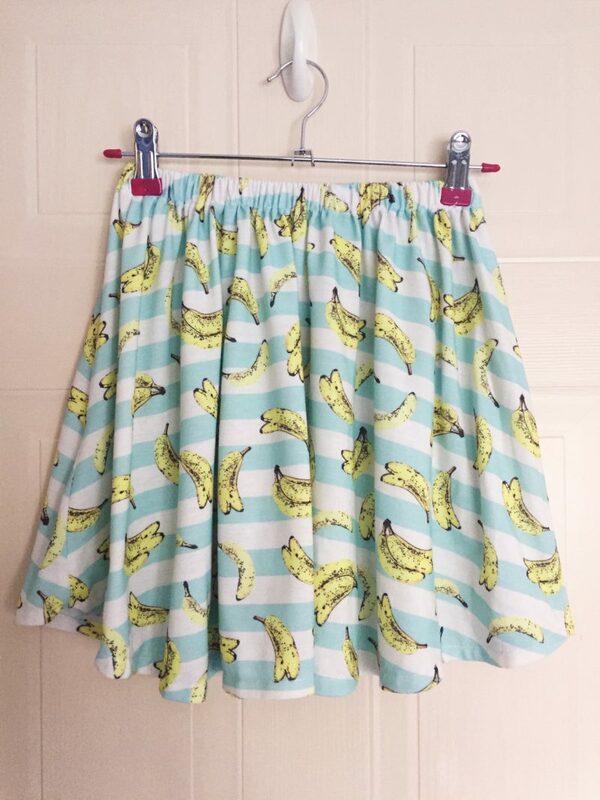 The simplest thing I could do was make it into a skirt, and I’m all for simple. I literally just folded over the top edge to make a channel for the elastic and boom! Done. To measure the elastic I put it around Eleanor’s waist. Nothing fancy at all. Even though this was so easy and quick, I’m really happy with it. It’s perfect for a six year old! Of course, Phoebe is not best pleased that she didn’t get one, but luckily for her I do still have almost a metre of this fabric left. I’m not sure all three of us need to be wearing matching outfits though! So there you have it, probably the easiest refashion in the world. I’m really pleased to have managed to make something wearable out of this dress though! Previous Post Should we only buy fabric when we need to?